Soccer Camp ended with a kids vs. coaches game. This was the first time during the week that I have seen Ella play because they had a large group time first thing in the morning and small group time right before pick up where they did not play. I was anxious to see if soccer camp had boosted Ella's confidence. was, Ella was there too (Ella is in the green tank top). Still a little timid, but right in the action. and Ella was right there with them. I was too busy celebrating to remember to take a picture. In other news.... As I said earlier, we recently made a trip to the library. Here is my stack of light reading that I picked up. I have not mentioned much about what is going on with our house because not much has been going on with our house. We have just been waiting, waiting, waiting.... Then this past week the City Inspector came and said that per our engineer reports, he wants all the finishes removed (sheet rock, floors, ceilings) to see the full extent of the damage. We have been waiting and waiting and now it seems we are about to have to start making decisions. I spent the last couple of days thumbing through these books tying to get ideas. Only one book had anything that was slightly promising. Right now it all seems a little overwhelming. I am taking any suggestions for websites, books or magazines with good home plans and ideas. Going through my camera tonight, I found a few pictures from moving. What is a move without sliding on boxes? SW even had a few turns, but they were to quick to capture. We ate several meals like this. table was the hardest to clear off. Murray broke down and got an IPad early this spring. We made it some time without the kids knowing what it was or that they could have their own games on it. But that did not last long. I am sure one day we were just trying to keep the peace and broke down and showed them a game. Well, since then there has been no going back. Miller loves Murray's IPad. The first thing he asks to do in the morning and the first thing he asks when Murray gets home from work is to play a game on Murray's IPad. Every few days Murray and Miller will search for a new game (always the free ones). Two days ago Murray put Angry Birds on the IPad. I know we are living under a rock, it is the number one game right now, but we had never played it before. Now we know why it is the number one game. It is awesome! Murray and I have even had a few competitions after the kids have gone to bed. Today Murray came home with a funny grin on his face and told Miller to check out the new Angry Birds. He actually bought the real version! For most people this is probably not a big deal, but I cannot remember Murray ever playing a game on the computer. This game is FUN and very addictive! It has definitely bought a little bit of competition into the family. You never know what is going to happen. I took Miller to get his hair cut today and left Murray with the girls. Everyone loves Daddy time! 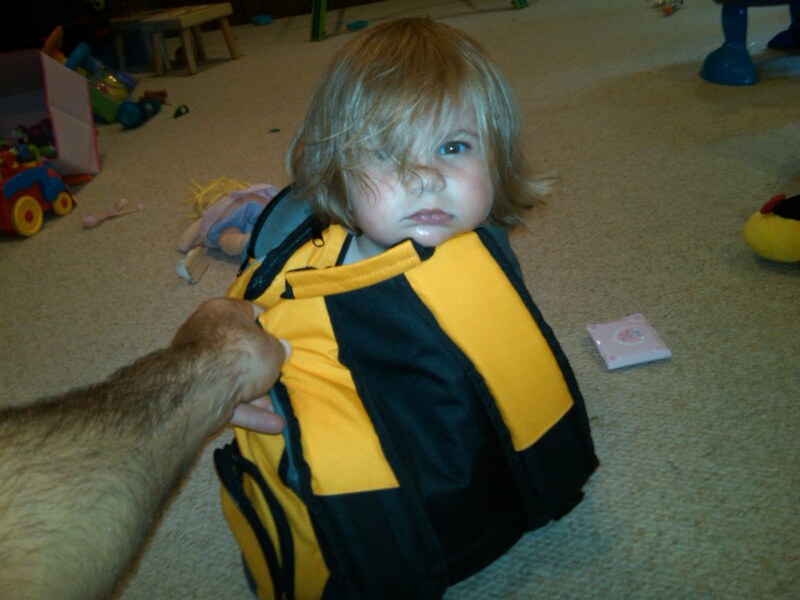 I don't know how this came about, but somehow Sara Wells ended up in the backpack. Supposedly, Sara Wells was loving it (although it doesn't really look like it here). Mix one cup of Plaster of Paris with 3/4 cup of water. Add paint color (the directions I read said to use powder tempera paint, but I could not find it. The regular paint worked pretty good, more on that later). I mixed the Plaster of Paris and water together and then divided it up into different bowls for the kids to add their own colors. All was going well until I suggested they might want to mix two colors together. The mixing of two colors turned into the mixing of all the colors which ruined the liquid to plater of paris ratio needed for the chalk to dry. I would suggest a one color limit if you are not going to use powdered tempera paints (which can be very messy). The chalks that had more than one color never hardened. For molds I just used flexible muffin tins. I thought they made the perfect size and allowed the kids to make a lot of different colors. The directions I saw suggested toilet paper rolls. Let that chalk set for a few days to dry completely. This is the hardest part for the kids. Ella and Miller begged to use the chalk over and over. I let them use some the next afternoon and it was not hard enough yet. But after a few days it was perfect. And they loved using their own sidewalk chalk. Definitely worth the wait. I know this is a lot of effort for something that you can buy for $1.50, but how boring to draw with chalk that you bought when you could be drawing with chalk that you made!!! Plus we are always looking for fun things that we can all do together to make these long, hot afternoons a little bit more interesting. We headed straight to the lake from the beach to celebrate 4th of July. I know, we were really toughing it, but somebody has got to do it:) (Don't be too jealous though, the day we got back we moved for our second time this summer.) The kids are always ready to celebrate something, especially if there are decorations. We had our second annual shrimp and oyster fry. I guess it is official that we have started a new tradition of a deep fried night. Stephen is our master Fry Daddy. If it was on the table it got fried, shrimp, oysters, peppers, onions, lemons, the paper towels even looked like they had been fried, but that was just all the grease from everything else. We felt terrible the next morning, but it was sooooo worth it! This trip to the lake for Sara Wells was a little different from her first. She is no longer afraid of the water, at all. The waves were so big from all the boat traffic that several waves splashed up and over her face and she loved every minute of it. While her cousins still tolerate it, Ella takes care of them every opportunity she has. I was actually proud of Ella, she completely changed Chloe, even the bloomers. Chloe is a squirmer, but that did not deter Ella. I love this picture. Sara Wells just stood and watched the whole interaction so glad that finally it was not her! We have not been to the beach in two years with the kids. Murray's grandparents have a beach house which we love and you would think we would definitely go every year, but between having babies and sick kids (we have had to cancel one or two trips at the last minute), we have not been to Pop and Dewey's since before Miller was born. It was soooo good to be back! You can literally feel pressure drop with each step that you take up to the front porch. For the entire month before we left there was not a day that went by that the kids did not ask when we were going to the beach. You could feel their anticipation building the closer we got to the beach. So when we arrived around 8:00 that night there was no way were were not hitting the beach. To say they loved it would be an understatement! And swimming at the pool! If you ask Miller what his favorite thing he did at the beach he will say fishing with Daddy. Which is very sweet, but funny since the whole event lasted about 5 minutes and was nothing like Murray had imagined his first time fishing in the gulf with his son would be. First big wave, "hold my hand Miller, we can make it through these." "Um Daddy, those are really big waves"
"It's ok Miller, I've got you." Surprisingly, Miller did not get deterred by the big waves. He was on a mission to go fishing with Daddy. Once he got on Murray's back he loved it! Unfortunately their fishing adventure was short lived because the seaweed was so bad that Murray could not cast the line because it was so heavy from the seaweed. adventure a little nervous for their brother's safety. Good bye "Dew Pop Inn"
Thank you for a wonderful vacation and wonderful family memories! Good bye beach, we will see you next year!